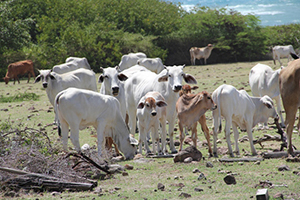 NIA CHARLESTOWN NEVIS (October 21, 2014) — Livestock production continues to be a priority area for the Ministry of Agriculture on Nevis and its push for improved management of small and large ruminants continues. That assurance came from Minister of Agriculture on Nevis Hon. Alexis Jeffers during his presentation at the 8th annual Consultation on the Economy. 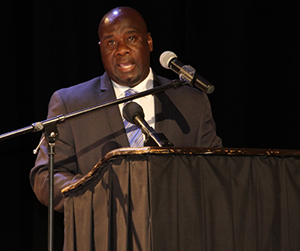 The event was held at the Michael Herald Sutton Auditorium at the Nevis Performing Arts Centre (NEPAC) on October 15, 2014. “We will continue to encourage and push for improved management of small and large ruminants. Plans are also afoot for the development of a forage bank at Maddens. We are all aware of what the extended dry spell has done to our livestock on the island and we will be taking steps to ensure that feed is available during such periods of drought. “There has also been renewed interest in poultry and pork production and we have in recent times witnessed the establishment of a number of businesses, in an attempt to satisfy the local demand for eggs and pork,” he said. Meantime, Mr. Jeffers spoke of plans for the Veterinary Clinic at Prospect. “We will in 2015, commence the expansion of the Veterinary Clinic. 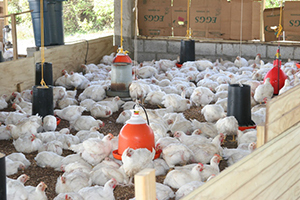 With the expected increase in livestock production will come the need for improved health care. “Our new clinic will be outfitted with ultra-modern equipment that will effectively service our livestock farmers as well as pet owners,” he said. The Agriculture Minister also spoke of the continued emphasis on value addition with regard to the government-owned Abattoir. “Some excellent work has been taking place at the abattoir and that will continue. 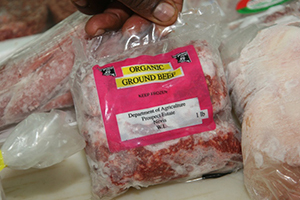 We have started to produce specialty cuts of meat and we have developed numerous products including patties, sausages and ground beef. “I am proud to indicate that practically every year we have new products being added to the already long list that exist at the abattoir,” he said.